Barely has it become available for test drives and ordering in Alfa Romeo's Italian showrooms than the new Giulietta has arrived in Hungary where it was the absolute star as Alfisti gathered en masse to celebrate the brand's centenary. Barely has it become available for test drives and ordering across Alfa Romeo's Italian network of showrooms than the new Giulietta has arrived in Hungary where it was the absolute shining star as Alfisti gathered en masse to celebrate the occasion of the brand's centenary. 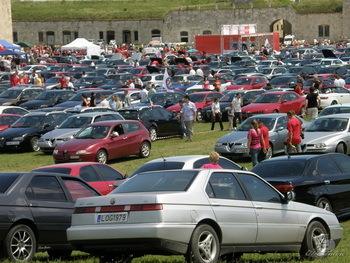 This year's edition of the highly popular AlfaCity event, which draws participants not only from Hungary but from surrounding countries and ones further afield, would have to be extra special as it fell on the one hundredth birthday of Alfa Romeo, and it meant that the organisers would need to put on an event to match the occasion. The day however proved to be a runaway success as around 1,000 Alfa Romeos and 4,500 spectators gathered at Fort Monostor at Komárom, Hungary, last Sunday (29 May) to celebrate the anniversary and see the brand-new Giulietta for the first time in the country. Alfa Romeo is busy celebrating it’s 100th birthday this year, an occasion which is being ccommemorated by Alfisti spread all over the world. In Hungary AlfaCity 100 was the official centennial event and was presented by Alfa Amore, the Hungarian online community made up of passionate Alfa Romeo owners and Fiat Autó Magyarország, the official Hungarian importer. The absolute star of this event was the brand new Giulietta, as this was the 5-door hatchback model’s first appearance not just in Hungary, but in Europe as well, outside the confines of the brand's domestic showrooms and on official test drives. The Giulietta returns Alfa Romeo to the vitally-important C-segment and replaces the long-running and much-loved Alfa 147. It is already enjoying a very good reception, since the Italian order book opened more than 5,000 orders have already been placed. 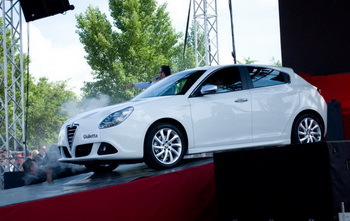 For its Hungarian debut the Giulietta was inaugurated at AlfaCity 100 last weekend with a special show, which involved Bernadett Vágó and Attila Dolhai, vocalists of the opera Romeo and Juliet, and Ferenc Rákóczi, a famous radio-anchorman. The stage burst with activity all day including musicians amongst the entertainment. While latter era Alfa Romeo models turned up in large numbers on the day, which pleasingly saw idyllic warm and sunny weather, including cars such as the 75, 145, 147, 155, 156, 159, 164, 166, GTV and Spider, stunning "oldtimers" gathered as well at Fort Monostor to join in the celebrations. The pages of Alfa Romeo's 100-year history came alive as models such as the slippery Bertone-styled 1750 and 2000 GTVs, and a pretty 2600 took their places in the line-ups; however the spectators chose a beautiful Montreal as the car on show they liked the most. Beside the many Alfa Romeos there was an array of other Italian cars on the grass: a true rally legend, the Lancia Delta Integrale, turned up, as did many Maseratis and Ferraris and the importer also showed off the Fiat 500.